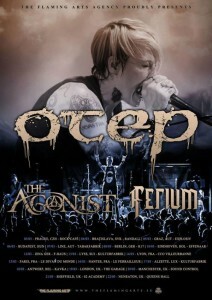 FERIUM Added to OTEP’s European Tour in March! Formed in 2006, FERIUM were initially inspired by Pantera and Lamb Of God but over time influence from the likes of TEXTURES, GOJIRA, DEATH and more found its way into their sound. 2009 saw their first EP The New Law which gained the band international recognition, enabling them to play large local events such as Summer Carnage and Hallelujah, but also shows outside of their homeland, including Wacken 2009. 2013 saw the band return to tour Europe/UK supporting The Agonist and Threat Signal. Featuring cover art by Eliran Kanto HATEBREED, SODOM, ATHEIST), Reflections is the culmination of four years of hard work, pain, passion, anger and hatred and the results are not for the faint-hearted. FERIUM released its debut album, Reflections on CD and digital formats via Transcend Music early in 2014 and is currently working on its next album. Reflections was met with praise by critics and fans worldwide and received Album of the Week honors from RevolverMag.com.